Acc: At this rate, I'll probably get a level a day. ACC: Beat the dragon and saved the princess. ACC: Level 7, got the Pirate Sword! ACC: Levelled from 1 to 10 yesterday! Didn't lose my progress at all :D! ACC: Half way to hero of gold! DIS: That's still quite a few..
ACC: 4073 swings at the time of writing! I'm comin' for ya carpal tornado! ACC/DIS: 62 Defeats! Nearly got orcs prophecy! But none of those were intentional! ACC: Seen Jimmy the eye 8 times! 2 more to go! Acc: Did it without contracts. Acc: Was level 5 for most of the fight, was level 6 for the last one. ACC: Got enough BP via AExtras to get all the upgrades. DIS: Character was deleted and I lost everything :(. ACC: Every single spell, merc, blades, in the game, all BP stuff bought. ACC: Beat the game on a new account without dieing once. ACC: Managed to get 200k gold! ACC i got 31/31 achivments! Dcc no armour so i have a doom shield an doom sword and pesent rags! MEGA ACC: Got my account back! ACC: Finished the current storyline at level 7, using a level 5, non-BP weapon. DIS: Still at the 7th enemy at Survival Mode when I'm level 9! ACC: Completed Survival Mode Mach I (Monsters). ACC: Got 70K+ gold due to Survival Mode, getting me closer to the 100K achievement! ACC: Cast 253/500 Spells for the Archmage achievement, thanks to Survival Mode. DIS: ...still have the 25 monsters to defeat. DIS: Still have 247 Spells and 30K- gold to farm for. ACC: Completed the entire Survival Mode! ACC: At 91K+ gold. Very close to 100K achievement. ACC: Beat Dragon, saved the damsel in distress. ACC: Unlocked every achievement but the 100 deaths one. 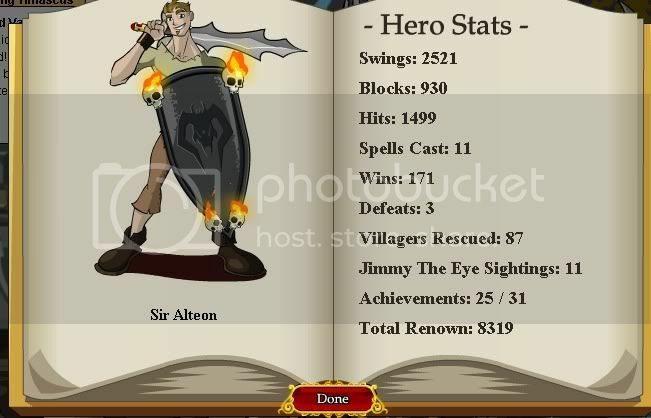 DIS: 634 spells cast...but no achievement. DIS: Have yet to beat it with the starting sword. ACC: Beat both modes of Survival Mode. ACC: FINALLY got those 2 survival badges. DIS: Still have a few really hard achievements to go.